One of the many fellow birding Jeremys out there has been in a bit of a slumber, but a mini big day on November 9 seemed to rustle the beast out of sleep. I could tell... when I dropped Jeremy Kimm off after a day that logged 100 species on the nose, he was already talking about weekend birding. On Friday evening, he checked back in to see if I was still game for a day out on Saturday, November 12th. Naturally, I was. I suggested Sooke and points further west and he agreed. We had intended to start our day at Billings Spit, but it was raining and we figured a brief check on the fields at Milnes Landing for gulls was in order. It wasn't a bad decision because we had a nice little group of gulls to sift through and we promptly pulled an adult Ring-billed Gull out of the mix. The salmon spawn was clearly on because we could hear a cacophony of gulls below along the Sooke River. I guess the smell of decaying fish is another telltale sign! We made our way over to the Sooke River Campground and pored over the gulls there, but nothing overly interesting jumped out. The skies looked like they were going to lighten up, so we moved on to Billings Spit. If you are from southern Vancouver Island and don't know Billings Spit, you are really missing out. Or... maybe it's just me that enjoys the birding there. It's a crazy mix of trailer parks, condos, houses, and industrial lots all set on a spit of land jutting out right beside where the Sooke River drains in to Sooke Harbour. I personally had never seen anything rare in the area, but I always thought it had immense potential. I like the area so much that I requested to do the Sooke Christmas Bird Count there last time I was around over the Christmas holidays. Okay... enough gushing about how good Billings Spit is and on to the proof that Billings Spit is as great as I am claiming! Jeremy and I drove out to the end of Kaltasin Rd and accessed the shoreline to see what the gull and waterfowl situation looked like at the outflow of the Sooke River. As expected, there were hundreds of gulls and ducks to scrutinize, but alas we could not dig out anything out of the ordinary. We then decided on Billings Rd to see if we could dig out any Townsend's Warblers. The spit is easily one of the best places I know to search for Townsend's Warbler in the winter because there is a bunch of ivy and ornamental shrubs that seem to maintain high insect activity levels. It was no surprise when we quickly heard the sharp "tick" call of a Townsend's from high up in an ivy-choked Doug-fir. Next, we caught up with a small sparrow flock and Jeremy called out White-throated Sparrow. It had momentarily popped down behind a fence, but gave itself up shortly after. We were feeling pretty good and decided we should move along, but I wanted to make a quick stop at Lannan Flats at the end of Seabroom Rd. This little slice of parkland is small, open, harbourside lot that is always worth a quick check. As we pulled onto Seabroom, Jeremy and I immediately saw the silhouette of a robin-sized bird sitting on the bare branches of a small deciduous tree. Jeremy joked "There's our Tropical Kingbird for the day." It was one of those jokes that is one part predictive and one part hopeful... and we were both thinking it. The bird then darted up, snapped up an insect, and returned to its perch. We raised our binoculars as a formality, but we already knew it was indeed a Tropical Kingbird! Through the binoculars, the lemon yellow underparts, grey head with ever-so-slightly darker auriculars, olive back, heavy bill, and lack of white outer tail feathers all cemented the identification. Any bird with "tropical" in its name is bound to look very out of place in drab, wet Pacific Northwest weather! We enjoyed the bird for a few minutes and then made sure to pass the word on to local birders over BCVIBIRDS. 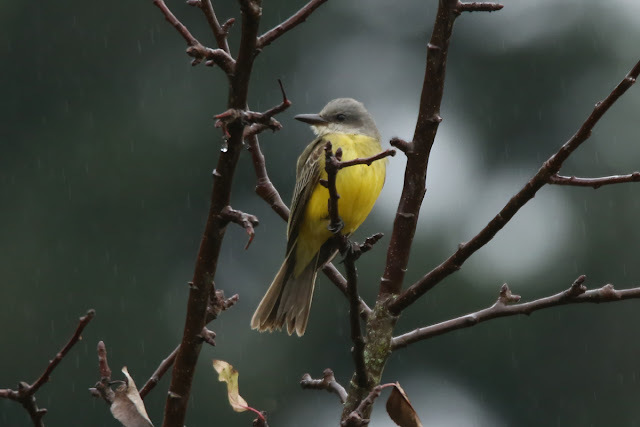 We have had Tropical Kingbirds on the Island this fall, but they were all up in the Tofino/Ucluelet area. Once that was out of the way, we went back to enjoying the bird for another 20 minutes or so. As you can see in the photo above, it had started to drizzle and the bird wasn't being very cooperative. It wanted to sit on a power line and I am not that keen on manmade features in wildlife photos. I wanted to document the bird from more angles, so I just gave up on waiting for more organic perches. The solid olive back really shows up nicely in this shot and perhaps the tail is trying to show a bit of a notch. Tropical Kingbird was one of the birds I had hoped I would be able to connect with for my self-found list, so it was a very gratifying sighting! 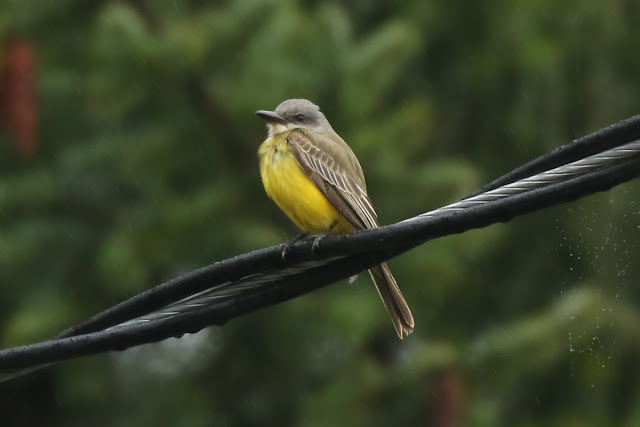 With the kingbird, my self-found list now sits at 258 for the Victoria checklist area. I won't give an extensive recap of the remainder of the day because the kingbird was the big highlight, but I will focus on our time at Jordan River a little. The birding at Jordan River had been decent in the weeks prior to our visit. Cathy Carlson had a Grey Catbird there on October 27 and Donna Ross and Ed Pellizzon had reported Palm Warbler on October 19 and November 4, respectively. The weather was mediocre and we worked hard to dig out something interesting, but the best we could muster on land was a Swamp Sparrow, Orange-crowned Warbler, and Common Yellowthroat. 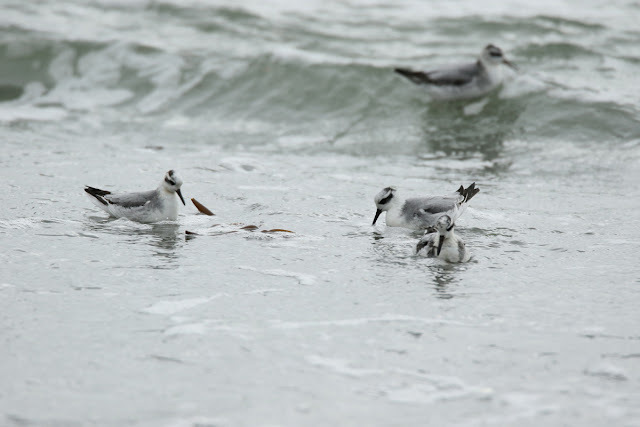 The most interesting sighting, however, was around 25 Red Phalaropes in the surf very close to shore just west of the bridge. Jeremy and I walked close to the water's edge and watched as the phalaropes frenetically fed and got tossed around in the surf. The winds were pretty strong from the southwest and seemingly pushed them right in. I had a feeling we might see some, but it was wild to have them so close. It got a little bizarre when a small group flew up and the wind pushed them over the shore and they actually landed on the sand. I had never seen a Red Phalarope out of water, but you could tell land-walking is not their forte! At one point, a lone phalarope landed just over a couple metres away. We were mildly in shock, but managed to snap off some photos. 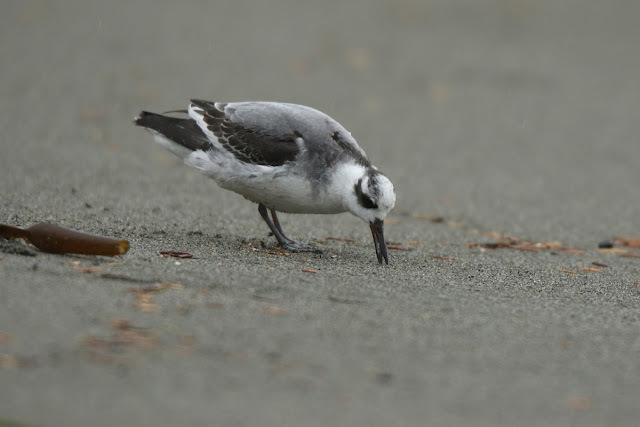 The phalarope invasion in the Strait of Juan de Fuca continues, so if you haven't seen Red Phalaropes before you should head out with a scope sooner than later. More recent reports off Victoria have been into the hundreds, so this is the year. The last major invasion of Red Phalaropes that I can recall in the strait was back in 2002, so don't let another 14 years lapse before you have this kind of opportunity! Awesome post Jeremy. Glad the 2 Jeremys are back together again ;). Awesome find on the TRKI and very cool to see the REPHs on the sand like that. Great shots. Cheers.